St. Baldrick’s has a special place in my heart. Thankfully, it’s not because I’ve had to benefit from their services, but a good friend of mine has. Last year, I did a post about Ian Keisacker and his fight for life. The publicity from the post pushed Ian’s goal from a humble $500 to over $1,000! I can’t tell you what that meant to me to see so many people reach out and help this young boy with something that means so much to him. This year, I’m thrilled to say that Ian is still cancer free and once again participating in the St. Baldrick’s fundraiser for cancer research. Unfortunately, there is no cure for cancer, so there is always someone out there suffering. This year, I’d like to bring your attention to a little two and half year old girl named Liberty. Liberty is a Michigan native and loves to sing and dance. 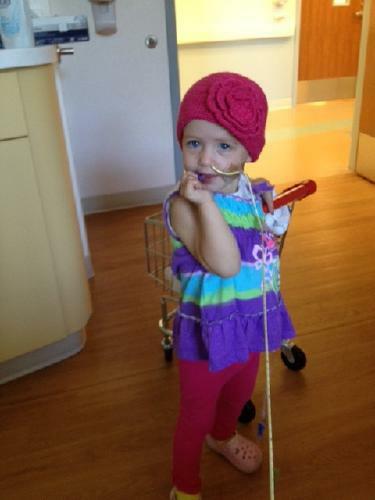 One thing keeps her from fully experiencing life…she has stage four neuroblastoma. Known as “TravelSize” by her 501st Legion Garrison, TX-4839 is a real trooper and rallying for Team Liberty. Their goal is to raise $500 for cancer research in Liberty’s name. In honor of Liberty and St. Baldrick’s annual shaving fundraising, TravelSize will shave her head if Liberty meets her goal! Every year, St. Baldrick’s hosts a head shaving fundraiser. Everyone is invited to participate and people of all ages get their heads shaved for the cause. Events are held in pubs, hair salons, homes, schools, and pretty much anywhere that will welcome the cause. The purpose is to show that while we have a choice in losing our hair, those with cancer do not. It’s a neat way to show your support for those suffering with cancer. I think we can help make that happen. How about you? To donate, head over to her fundraising page. Every dollar helps and nothing is to small a donation. To learn more about St. Baldrick’s and their mission to help cure childhood cancer, check out their website. May the force be with Team Liberty! ← Mega Con 2013 or Bust!